Classic dress-up collar with detachable bow tie. Velcro closure. 50% cotton, 50% satin. 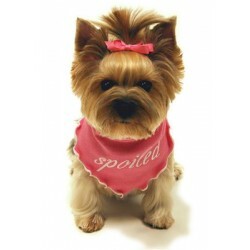 Sizes: XXS/..
Show your doggy some love with this adorable reversible scarf! This scarf is perfect for Valentine&#..
Dog Collar and Bow Tie Set. Perfect for dressing up! Detachable Bow Tie Velcro Closure 50% Cotton.. ADORABLE!! These bowties are approximately 3-1/2" by 2" in size. The have a slide adjus.. Dress up your baby boy with this bling dress-up bow tie collar with sequins. This bow tie collar fo..
A perfect scarf for the social network savvy. This scarf is made of soft cotton with a hint of lycra..
Show off your Good Dog with this scarf made of super soft cotton with a hint of lycra. Rhinestones a.. Fashionable! Trendy dress-up collar with detachable bow tie. Velcro closure. 100% cotton. Sizing: .. Handsome! Dress-up collar with detachable tie. Velcro closure. 100% cotton. Sizing: XXS/XS 6-8" n.. Dress Up! What a unique and eye catching dress-up collar with detachable bow tie & velcro closure. S..
Nicholas Shirt Collar and Tie for Dogs! Handsome! Classic dress-up collar with detachable tie. Velcro closure. 100% cotton. Sizing: XXS.. Your dog will be the best-dressed at the Christmas party in this handsome red Christmas themed dog t.. Elegant! Dress-up collar with detachable bow tie. Velcro closure. 50% cotton, 50% satin. Sizing: ..
Red Checker Bow Tie for Pups! Handsome! Classic dress-up collar with detachable bow tie. Velcro closure. 100% cotton. Sizing: ..
Beautiful Satin Bowtie Collar....perfect for dressing up! Dress-up collar with detachable bow tie V..
Get Santa's Scarf for your precious pup to wear during the holidays! * Polar-fleece (polyeste..
Sparkle! Unique and eye catching dress-up collar with detachable bow tie. Great for that New Year's..
Star Shirt Collar for Dogs! For Your Patriotic Pup! Patriotic dress-up collar with detachable tie. Velcro closure. 100% cotton..
Super comfortable cotton lycra scarf gives style to any formal occasion. Small fits nec..